There has been a number of new items added to the Cotton Patch site over the last month. We have expanded our range of batik fabrics with sixteen new fabrics with the By the Pool and Streaks and Splodges ranges. 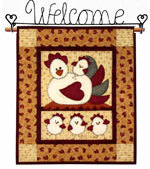 For a cute little project we have a new kit from Rachels of Greenfield called Baby Bear. There are lots more products in the pipeline with Kaffe Fasset kits and fabrics, some wondeful new Free Spirit fabrics, new notions from Clover, new books and Calendars for 2009. We also have a major project that we are all working very hard on for the website. Well, I must apologise to everyone for not posting any Whats New updates for a while and the main reason is the arrival of James, my newborn son. He is now a healthy and increasingly heavy seven weeks old and dominating our lives totally. When he was five days old then we had to take him back into hospital and he stayed for four days as a precaution. This was very much a rollercoaster for my wife and I but whilst in hospital then the nurses made James a little nest from Project Linus Quilts to sleep on in the hospital cot. 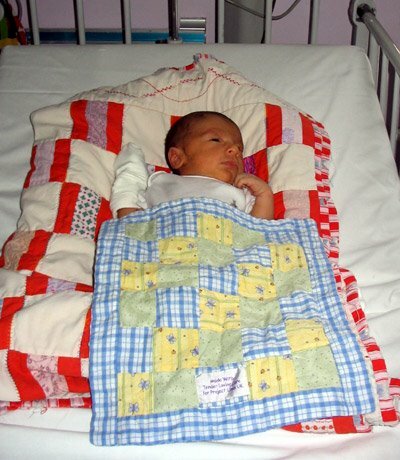 Liz has mentioned before the great work that Project Linus do of providing quilts to hospitals. Having now been on the receiving end of these quilts then I would just like to say what a difference they make. Hospitals are by inference cold and clinical places and having something that is bright, cheery and a reminder of home can really make a difference to how you feel. James now has a Winnie the Pooh quilted playmat made for him by his Nanna Jean and is quite tired out from his exertions, allowing his father some time to blog away.